Music channel Mnet is launching a new show, in search for the best children’s song. In the new show, called “We Kid,” short for “We Sing Like a Kid,” teams made up of children, top stars and composers are created. They come up with new songs that cater to children. Aspiring young singers who pass a preliminary audition are matched with one of three teams. The first comprises actress Park Bo-young and composer Yoo Jae-hwan. The second consists of actor Yoo Yeon-seok and composer Yoon Il-sang. The third team is made up of hip-hop artist Tiger JK and artist-composer Bizzy. 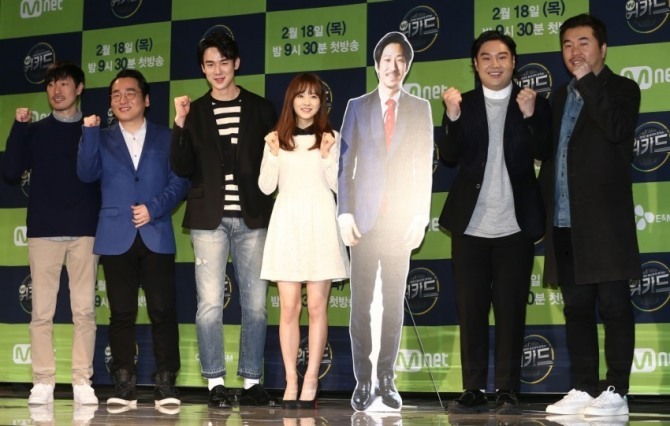 The new show was created by producer Kim Yong-beom, who led the competition program boom in Korean TV with the talent competition series “Superstar K” and the dance competition program “Dancing 9.” It aims to create a “turning point” in the stagnant children’s music market, according to an official press release. That “Mnet style” is what has some people worried. The channel’s competition programs have become infamous for their aggressive editing style, which has been accused of exploiting emotional moments or tipping the scales in favor of particular contestants. Recently, the channel received flak for the rigorous way in which it produced competition shows “Sixteen” and “Produce 101,” both of which included contestants as young as 13 years old. Even before the show went on air, some viewers feared that the stress might be too extreme for young children. Kim said that the show, which is not structured as a survival-style tournament and does not eliminate anyone, has put “measures” in place to prevent hurting the children, although he “could not say” specifically what they were. He also said that the choice of Park Bo-young, Yoo Yeon-seok and Tiger JK as the children’s mentors was part of the program’s efforts to shield the children from unnecessary stress. According to Kim, they avoided bringing on familiar faces from tournament programs or music specialists because they often showed less interest in the contestants “once the camera was off,” but these three celebrities showed a more sincere interest in music and the children both on and off-camera. “They’re written for children of that era. Since there are no new children’s songs that appeal to children today, kids are left listening to (age-inappropriate) pop songs,” he said. The eight-part weekly series “We Kid” premieres on Mnet Thursday at 9:30 p.m.